Rachel McAdams updo hairstyle: Beautiful caramel swirls and a smooth, angled fringe make a wonderful creative contrast in this trendy formal-casual look! Rachel’s hair has a slightly off-center parting, with a trendy, asymmetric, side-swept fringe. The careful definition of the strands keeps the long fringe light and really accentuates her eyes. The other side is swept back leaving a few loose strands over the ear to soften the profile. The French Pleat chignon at the back is smooth and the long hair around the crown forms a fabulous swirl of lightly highlighted caramel and honey waves. The waves are slightly tousled, to show that this amazing evening up-do is a totally 21st century topknot! Do you love this style? Find more elegant updos in the updo gallery, and more beautiful chignons here. 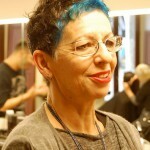 Under: Popular Hairstyles Timeless Pixie with Blue Surprise!